Through a connection with a friend I was fortunate enough to get an appointment with Lobsang Dhondup, a Tibetan doctor who travels from his healing center in San Diego once a month to see patients in Sausalito. About eighty percent of Lobsang’s new patients have cancer. Lobsang listened to my pulse for a very long time and diagnosed my condition as “wind in the blood.” There are several interesting parallels between “recycling blood,” my Traditional Chinese Medical diagnosis from the Pine Street Clinic, and “wind in the blood.” I have been studying Tibetan medicine a bit, and comparing it to Traditional Chinese Medicine. In both, individual imbalances occur through disharmonies in the elements that comprise our systems. In Tibetan Medicine, these elements are Wind, Bile and Phlegm, while in Traditional Chinese Medicine they are the five elements of Earth, Water, Wood, Metal and Air and their connection with the corresponding organ meridians. Wind, as I understand it, has a lot to do with overdoing it – hurrying, craving or experiencing desire, feeling intense emotions, exposure to wind and the elements – a general lack of nurturing. The antidote to “wind” is diminishing craving and desire, living in a warm dark place and eating rich, oily foods. I’ll talk more about diet in another post. Lobsang gave me two different bags of herbal pills. The herbs were prepared in India by hand and dried in little balls. 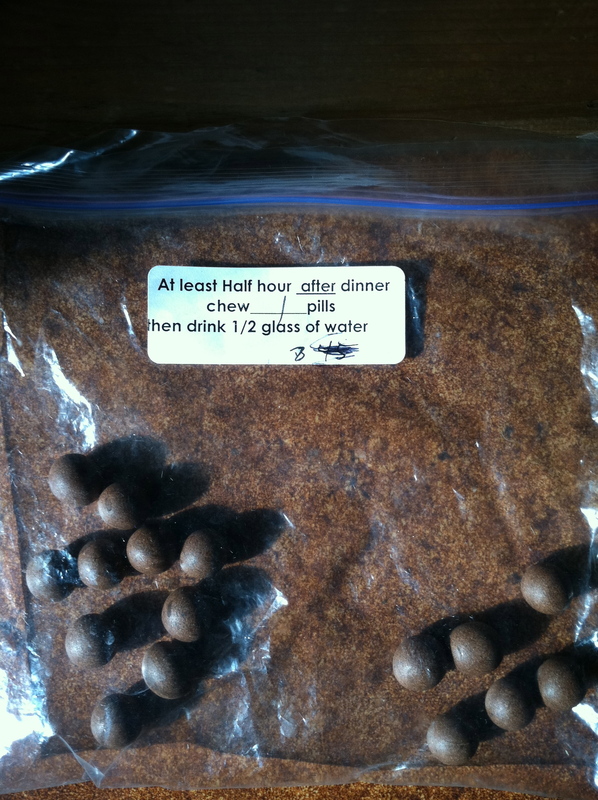 In the morning I chew three detoxifying herb pellets, and in the evening after dinner I chew one calming pellet. These are the pills I take every evening that are calming. In the morning I take a different set that are detoxifying. Lobsang’s herbs have completely eliminated the side effects I was having from the Tamoxifen: hot flashes and interrupted sleep, and even I can feel that my pulse is stronger now. My menses had completely stopped from the Chemo and Tamoxifen, and since I’ve been working with Lobsang, it has returned. The herbs encourage me to sleep more deeply and for a longer time, allowing my body to replenish my spirit and organs and continue the process of breaking down the tumors. Lobsang said that strenuous activities could increase wind. He suggested that I stop practicing aikido and instead practice yoga or other more soothing activities. This is challenging for me, as I do love aikido, but I am learning in all of my activity to listen even more carefully to my system and not over-tax it. Currently I am seeing Lobsang once every two months. He continues to listen to my pulse and change the herbs as needed. I have been practicing as a homeopath since 2005 and during my life I have seen many practitioners, in my opinion, Lobsang is one of the most skilled practitioners of alternative medicine, period. Annie Bachelder, Chronic Wellness Program & Akashic Records Practitioner www.AnnieChannels.net. I was diagnosed with Multiple Sclerosis in 1990 and had attacks about every two years that chipped away at my vision, energy and abilities. In 2001 I had the biggie - I had to be taught to walk again and my right arm was completely paralyzed for a time. I had an AFO for a foot flop, a cane, and lived out of hospital bed for two years. I had to move in with my Mother for help dressing, bathing, laundry, shopping and meal prep. I recovered somewhat over the next years but was still extremely fatigued and needed help with activities of daily living. In 2010, I was meditating in earnest 7 days a week, reading deeply spiritual books daily, and was inspired to eliminate wheat and sugar from my diet. Improved somewhat, however, it was in the summer of 2010 that I began treatment with Dr. Lobsang Dondhup when I was brought back to true health. By August, 2011 I was amazingly well and able to help my Mother - instead of the other way around. I was astonished to think, "I could actually be well?! I could really be well!" Six months later I was interviewing for part time jobs and resuming my self employment as a psychic and channel. Six years later, I have been free of MS, live a full life and am dedicated to helping others with chronic illness. Today, no one sees the sick person I was. They see a vibrant, happy, healthy, extraordinarily functional woman. I am restored! When I was 27, I was in a car accident and my heart stopped. I sustained many broken bones and a punctured lung. It was a long recovery. I never regained my stamina. I have found Lobsang to be a treasure. When I first met Lobsang , I was taking 8 prescription drugs, suffering with asthma and always tired. Within 3 months I did not need any of the medication, had changed my diet radically ( and I had always eaten organic and what I thought was healthy). I now need an hour less sleep, have so much energy and know the herbs I need as we go through the year, since our bodies change with the seasons. I have no problems with asthma and my gastrointestinal issues are under control. I have probably sent 40-50 friends and family members to see Lobsang and they all have seen improvements and sing his praises as well. Lobsang has made all the difference in my health improvement. I have energy, I am happy and most important I am well after years of fatigue, depression, several cancers and very poor health. I cannot recommend him enough to everyone. Tibetan medicine is amazing, as is Lobsang himself. Lobsang is my main man. After 12 years I am still ALS symptom-free after my initial treatment by Lobsang. All my ALS symptoms disappeared: no back pain, no more peripheral neuropathy, and my throat completely cleared.My recommendation for you is to try out Lobsang first for the best chance for change in your health. Call me for any questions. When I first consulted Lobsang Dhondup, I was completely immobile due to a virus in my muscles and an acute case of fibromyalgia. I was taking high doses of prednisone and anti-inflammatory medicine and experiencing many bad side effects from the medicine. After three months of herbal therapy, diet change and treatments by Lobsang Dhondup, I was free of pain and medicine dependence. He was truly a gift to my life. I was diagnosed with Multiple Sclerosis in August 2001. After a long hike on a hot summers' day my spine was tingling so much it was leading me to distraction and I lost the ability to use my right arm and hand. Previous to this over the past few years I'd experienced periods when I noticed a lack of feeling in my right fingertips, a tingling all down my spine, legs and arms when I put my head to my chest and couldn't feel the difference in water temperature between hot and cold. I also experienced severe depression. Western medicine led to six MRI's, a spinal tap, and I was treated with six weeks of steroid treatment both aurally and intravenously (as well as them not being able to tell me if I had MS or a brain tumor). The side effects of the drug treatment included bloating, a 'moon face' appearance and red swelling and burning of my cheeks, vomiting, disorientation, hallucinations, fatigue, and pain around the injection sites. I didn't ever take the western disease-modifying drugs for MS such as Avonex*, Betaseron* or Copaxone* because in November I became pregnant and these drugs are not safe for pregnant women. Also, because of the horrible effects I experienced from the steroids, my husband and I decided we did not want to go with western medicine and that it would be better for me to get sick gracefully with my mind rather than with my body full of chemicals. Soon after I gave birth in June 2002 I had more symptoms. Now my ability to walk was weakened and my legs would just give way at any time; my balance was compromised and I really felt like if they were to get any worse I would need a wheelchair; the nerves at the base of my spine felt like they were no longer alive and I'd lost all bladder and bowel control and sensation, and at the other times was constipated. The western doctors told me I either needed a hysterectomy to take the pressure off my pelvic area which had collapsed or I'd need surgery which included silicon implants in my pelvic area to rebuild everything. Because of this I was told that I wouldn't be able to have any more children because my body was not strong enough to cope with pregnancy. The right side of my face was numb as though injected by a dentist and the right side of my torso was also numb and tingly. I'd also noticed fatigue after taking a hot shower or bath and increasing fatigue when I was stressed or hot and was often 'moody' and depressed. 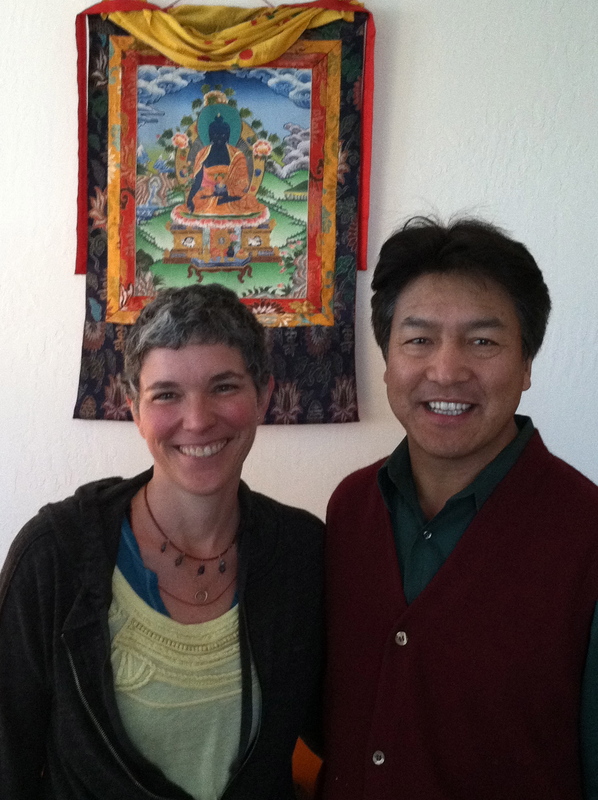 In October 2002, I met with Dr. Lobsang Dhondup at the Tibetan Healing Center. Without me telling him what was wrong with me after looking at my urine sample and reading my pulse Lobsang asked me how long I'd been living with Multiple Sclerosis. He was able to tell me that it was a very slowly progressing MS, and that it was very deeply imbedded inside me. With his suggestions on diet, exercise and vitamins and the Tibetan herbs, he indicated that I might be able to slow the progression. I have been working with Lobsang now for more than two years and I now show no signs of the dis-ease. I have no symptoms of it. I have regained all the feeling in my limbs, hands, face, torso and vaginal area. I am so strong that I now have complete bladder and bowel control and do not need to have any sort of surgery. In fact, Lobsang has told me that if I remain true to the work we've done together, I'm strong enough to have more children! After I had been seeing Lobsang for a year I found that if I got overtired or overheated my symptoms might slightly return, but only to a tiny degree or I might need to urinate more urgently than someone else and that my face felt a little tingly, but was not numb. A year later, I have no signs of any MS symptoms at all and I understand my body enough to know how many late nights I can have or foods off my tailored diet and know when to rest and what to do to keep my body in balance. Tibetan medicine is holistic and the understanding of the Tibetan physician is that in a balanced body, mind and spirit there is no room for dis-ease. As well as prescribing Tibetan herbs, Lobsang gives recommendations of vitamin supplements, diet, exercise and lifestyle adjustments. It is important to understand that Tibetan medicine balances the individual body, so a specific diet for one person might be completely opposite for another person with a similar disease. One of the major reasons I believe I am so much better is that I do exactly as Lobsang suggests, even though it has meant major changes for me and my family's lives. I take the herbs prescribed by Lobsang exactly when and how he tells me to take them. The diet Lobsang has tailored for my situation is no dairy, wheat, yeast or meat, sugar or salt, but lots of vegetables, fruit, oils, fish and raw nuts. This indeed may sound restricting, but really isn't, and like I said, not eating sausages or pancakes is really nothing compared with not being able to run and play with my kids. He recommends that I gently walk twice a day for at least 10 minutes to keep my legs strong and do gentle yoga a few times a week. I also have Reiki treatments and have learned to do Reiki myself so I can help my own healing process without necessarily having to go to a Reiki healer and I also practice meditation daily. Just as important as all this I make sure that I get plenty of rest and try to avoid getting sick. Working with Lobsang has changed mine and my family's lives. When I was diagnosed with Multiple Sclerosis it felt as though life was ending, however since working with Dr. Lobsang Dhondup and the Tibetan Healing Center we now feel as though our lives are just beginning. Words cannot express my heartfelt thanks and love I have for Lobsang, Sondra, Didi and everyone connected with the Tibetan Healing Center. . In 1995, as a healthy, mindful woman, I was stunned to be diagnosed with breast cancer. There was no family history of breast cancer and I had breast fed my children. My diet was healthy and I exercised several days a week. Yet, here I was, facing surgery and six weeks of radiation therapy in order to rid my body of a malignant tumor. Seven years later, I, again, confronted the same diagnosis in the same location, moderate ductal carcinoma. However, having previous radiation, the only option offered by Western medicine was a mascectomy, followed by chemotherapy. The day after my diagnosis, I met Didi Otterson at a community conference on breast cancer. There, in a crowd of three hundred people, Didi enlightened me about eastern medicine and told me of Dr. Lobsang Dhondup. I immediately returned home and phoned his office to make an appointment to seen him. Five days later, on the day I was to have had my mascectomy, I instead was meeting Dr. Dhondup. Without knowing anything but my name, he held my wrists for about five minutes, then asked if I had had my biopsy yet. Through pulse point diagnosis, he knew I had breast cancer in the left breast, that it had not spread to the lymph nodes, but that it had grown large enough for concern. He explained I had options, including taking only the herbs, and/or combining herbs with mascectomy and chemotherapy. I chose to place my health in his very capable hands, and requested the herbs. Dr Dhondup explained that I would need 7-10 months of herbs before seeing the expected positive results. My oncologist, already aware of Dr. Dhondup's reputation, agreed to continue monitoring me with semi-annual breast check-ups and allowed me the opportunity to work with Tibetan herbs before proceeding with a masectomy. She was most helpful in sharing records and information with Dr. Dhondup in an effort to support my choice of healing approaches. Also, I appreciated knowing that alternative approaches to healing--especially ones that are as effective as traditional Tibetan herbal medicine--are being recognized and welcomed by Western medical practitioners who are open to integrating and learning effective whole-body medical practices. The first month of Tibetan herbs was preparing my body for even stronger herbs the following month. The second month Dr. Dhondup had me take 2 precious pills, each wrapped in a small box, wrapped in saffron silk. The 14th day of the second month I took the first of my 2 precious pills. I slept all day and felt my body heavily detox as evidenced by profuse and continuous sweating. I believe this was the turn-around space for my healing process. The 28th day I took the 2nd precious pill, but my body did not react as strongly. Within 2 months I was completely in remission. My path of healing is ongoing. I have made personal discoveries along the way that lead me to realize how stress, especially emotional stress, is a major contributing factor, especially someone like me who had no known predisposition for breast cancer nor any symptoms of it. Breast cancer surveys in 1995, when I first had breast cancer, rarely included questions about stress. Today, the medical research confirms it as a major cause of cancer. Now, three years later, I continue to live a very healthy, energetic, and balanced life. I return to Dr. Dhondup for the pulse point diagnosis every six months. I remain cancer free, living always with a heart full of gratitude and respect for Dr. Lobsang Dhondup. With the help of Dr. Lobsang and The Tibetan Healing Center, I was able to drop 130 lbs. (from 325 to 195) over the past year. After my first appointment, I was given Tibetan herbs to balance my system, as well as a list of recommended food for my body, foods I shouldn't mix, and foods I should avoid altogether. The Tibetan Healing Center helped me correct my poor eating habits and encouraged me to begin exercising. this allowed me to create an ideal food plan and exercise schedule that let me drop the weight naturally. We originally went to see Nirvair to help my four year old son who had a difficult time joining in playgroups, always appeared afraid to meet new people and would often "cling" to his mother and father. Nirvair worked on John and determined that he was harmed as a child a great number of times during his past lives. Nirvair removed those ties and when we took our son to school the very next day he hugged his teachers and for the first time started to play with children. His teachers even called us at home that evening to find out what caused the big change. As parents, we are at a loss for words to describe our gratitude regarding how Nirvair has helped our son. We have come to learn that there are many ties that pass through our lifetimes which can deeply affect our current behaviors. I would just like to take a minute to thank you for all the support, wisdom and spiritual counceling you have so generously provided me over ths past difficult weeks. As you know I was in deep sadness and depression. I had almost give up hope, and beliefs were waning. I did not know what to do or what to think. Your sensitivity and understanding were a blessing. Your counseling helped me see things in a better light and gave me renewed hope. Thank you for sharing yor time, wisdom and blessings. Nirvair has truly been a incredible experience for me and my life. He has moved unresolved grief, my energy has heightened, my thoughts feel clearer and I have greater insight on a vision for my life. I recommend Nirvair for any person seeking more balance and clarity in their life. Overall I find a beautiful safe source in Nirvair and his work in guiding me to a higher quality of life. Thank you for your goodness and healing.